Grilled Corn on the Cob is such a delicious rustic side dish from my childhood. Growing up with a large backyard garden, we always had a few long rows of corn growing. In the autumn, we would clear the yard for winter before the snow came, and have a burn off with a large bon fire. Into the hot coals, we would throw foiled potatoes and fresh corn on the cob to be cooked in the coals. Living in an urban neigbourhood, it’s not possible to have a large bonfire, but everyone has a barbecue. They key is to soak the corn with husks on, in water for at least 10 minutes (longer is ok). Most people use a string to tie the husks together. It’s optional to tie the corn husks with wire. I used wire as I think the string will burn off, exposing and burning the bbq corn (plus all guys have wire lying around). The herb butter mixture is flexible with the flavors you want to add. I just throw in whatever herbs I have growing in the garden. You can also add spices, such as cumin and paprika, or even cajun spice, for a different buttery flavour on your bbq corn. Experiment and have some fun with the butter. 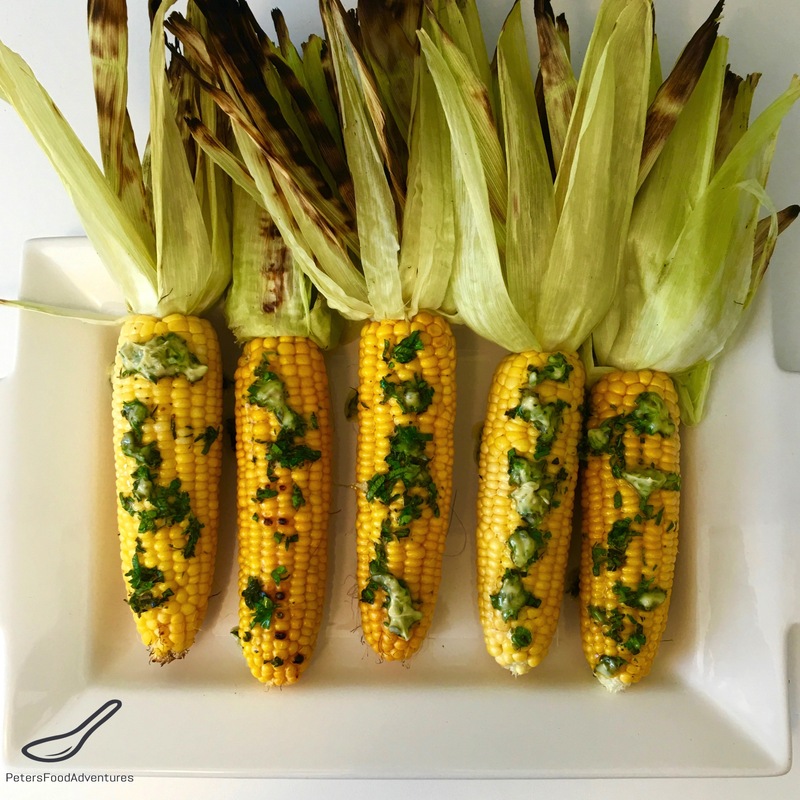 It’s so easy to make this dish, with a great visual appeal when you make Grilled Corn on the Cob with Fresh Herb Butter. Perfect for your next backyard bbq. Bon Appetit! Приятного аппетита! Just in time for summer entertaining. 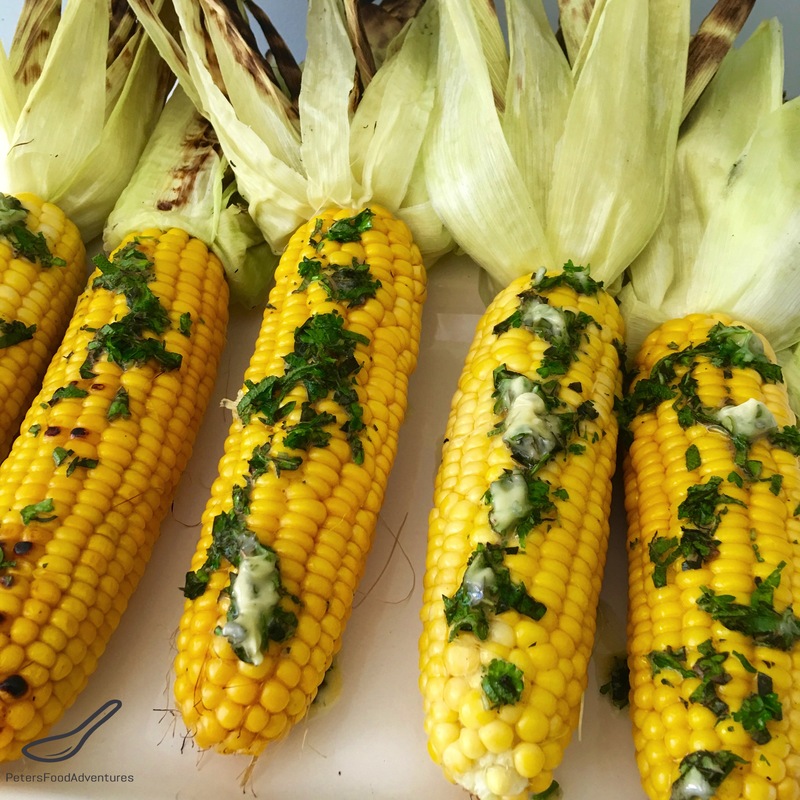 BBQ Grilled Corn on the Cob with fresh herb butter. Easy to make and full of flavour! To make the herb butter, mix the softened butter with chopped parsley, oregano, thyme, sage and salt. Set aside. Pull the husks of corn down to the base, keeping them still attached to the corn. Careful not to pull them off. Pull off the corn silk until the corn is clean, as this will burn on the barbecue, then close back the husks back to their original place. Optional* Tie the husks together with a string or wire, to keep the husks from opening, exposing the corn and burning. Soak the corn in water, completely submerged for at least 10 minutes. Shake off the excess water off the corn and place on the barbecue grill. Bbq for about 15 minutes, or until the corn easy bursts when pierced. Turn the corn over every 5 minutes. Open the corn, leaving the corn husk still attached at the base of the corn and spread with the herb butter. My favourite are boiled corn with salt. This looks awesome! Grilled corn is a very popular street food option here in India too! Since it doesn’t snow in this part of the world, we enjoy it during monsoon. I think the chill in the air and grilled corn on the cob go hand in hand. Loves grilled corn and really love your herbed butter slathered on it ???? Thanks Linda, nothing beats fresh corn! ??? ?Hopefully snow melts soon and it’s a short winter! Hope so!! 🙂 Have a nice weekend! Nice… I’ll try your herb butter next time. I usually wrap in tinfoil… thanks for the idea, Peter, much more attractive to wow the guests… and that’s half the fun of cooking for friends. There’s a lot be said for that too. Lovely memories and yummy corn Peter! Thanks Lynne! I sure loved having Bon fires! The best I can do in a suburban yard is a small fire pit! ???? New memories for a new generation! ??? ?